The trace metal facilities in Chesapeake Bay Hall include a conventional "dirty" laboratory with chemical fume hoods, analytical balances, drying oven, muffle furnace, and HEPA-filtered clean hood. The RaDeCC is also housed in the dirty lab. 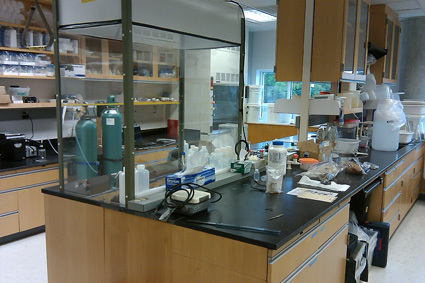 This lab has plenty of space for non-critical labwork, experimental setups, and fieldwork staging. It also houses various field equipment such as portable HEPA-filter hoods, a portable peri pump, YSI multi-probe, and a Retract-a-Tip groundwater sampler. The clean lab is still under construction, but is nearly finished. (Follow the progress here!) When complete, it will provide exceptional space for ultraclean trace metal work, with a HEPA-filtered polypropylene fume hood, all-plastic lab benchwork, non-contaminating ceiling and light fixtures, and will be under constant positive pressure from HEPA-filtered air. 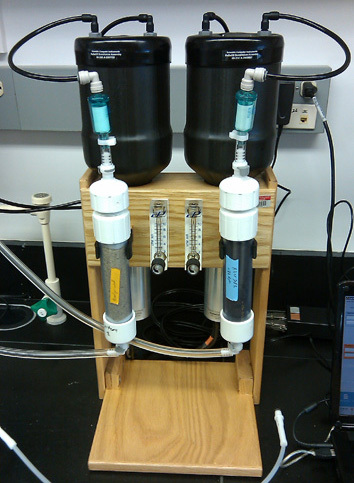 A Milli-Q Element system provides ultrapure water. The ICPMS is housed in a shared mass spec laboratory in Watermen's Hall. Installed in March 2010, the ThermoFisher Element 2 ICP-MS is our analytical workhorse. Its phenomenal capabilities include the ability to measure most of the periodic table with part-per-trillion detection limits and linear response over an incredible 9 orders of magnitude. Medium- and high-resolution modes allow interference-free measurement of important analytes such as iron and arsenic. 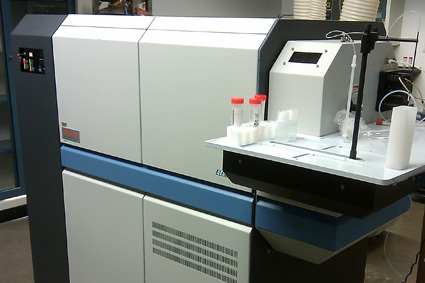 An ESI autosampler is interfaced with the ICPMS for routine high-throughput analysis. The naturally-occurring radium isotope suite is a powerful tool for measuring water mixing and transport in coastal marine waters. We use a Radium Delayed Coincidence Counter (RaDeCC) to measure three of the four Ra isotopes. This system uses radon emanation and alpha scintillation to detect the very low levels of Ra found in natural waters, and specialized software discriminates between decay patterns of the different Ra isotopes. Dissolved Ra is measured after extraction onto Mn-oxide-coated fiber, and sediment-adsorbed Ra can be measured directly.